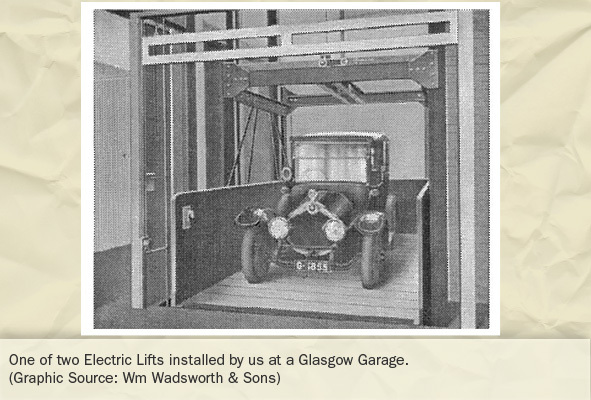 As various eras of transportation gained prominence, the lifting industry and its machines provided support systems. Water was the first medium of transport whether small craft on the rivers of the Middle and Far East, or ships upon the Mediterranean and Indian Seas. Naturally, the hoisting of sails made travelling long distances easier and oars were the levers of motion. Where no waterways existed, they had to be introduced in the way of canals. Lifting machines dug the canals, but once water flowed within, craft could not be moved uphill! 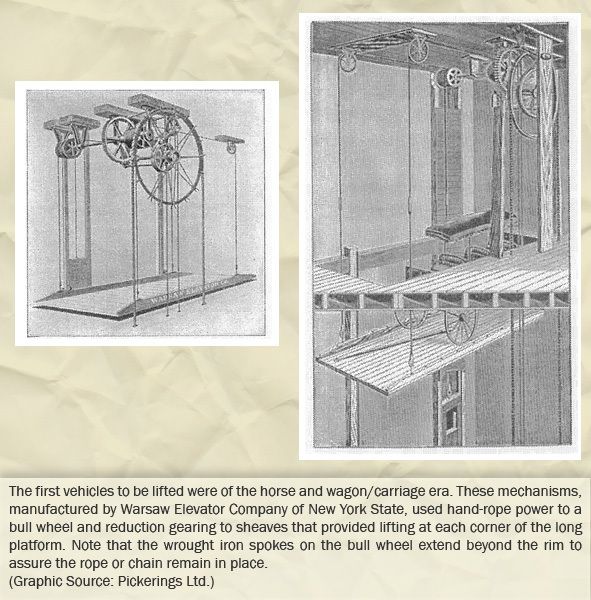 Solving the elevation of barges and other canal craft brought some of the industry's most innovative lifting -- the shiplifts -- and, not to be forgotten -- drydocks that lifted ships completely out of the water! As luxury ships housed hundreds, even thousands of passengers, they became mini-cities requiring transportation between levels. Rail and train travel competed on land, century after century, through all power eras. However, even the heaviest rail cars had to be lifted for maintenance by hydraulic power. Automobiles were also raised for maintenance, but by far the greatest problem associated with cars was their overabundance in urban centers. Storage schemes proliferated to alleviate serious congestion problems. 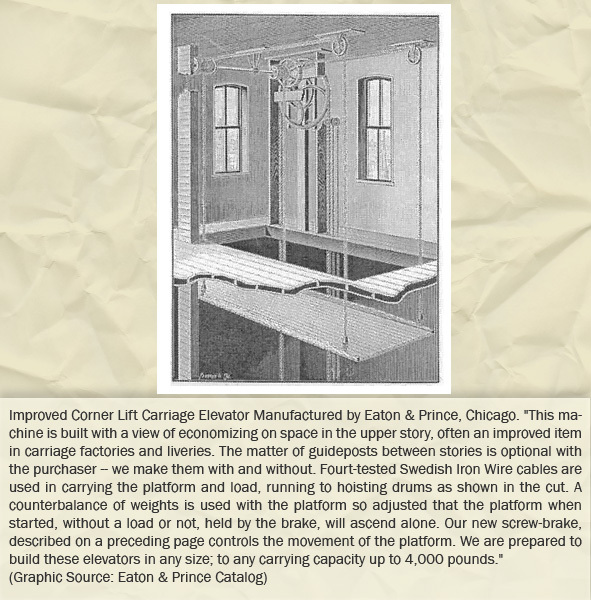 As will be seen in other galleries, -- Escalators and Moving Sidewalks -- during the era of air travel, as aircraft became larger, they had to be dispersed in more widely separated areas for embarkation. 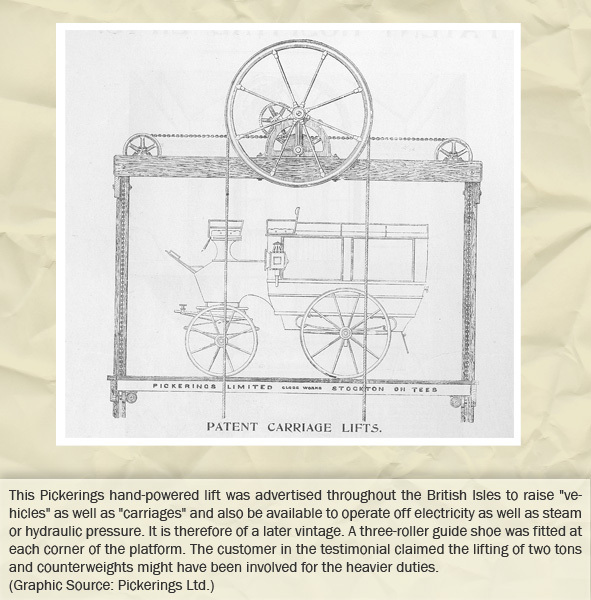 This necessitated the continuous movement of people between planes and land transport. 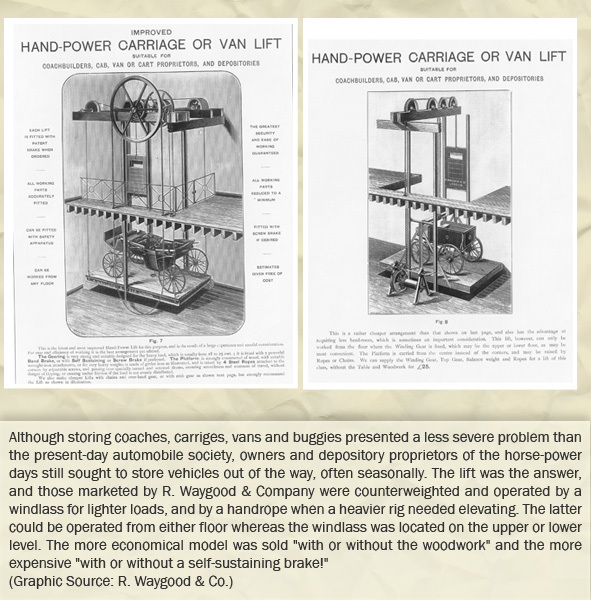 Escalators, moving sidewalks and shuttles helped alleviate this problem. Water was the first medium of transport whether small craft on the rivers of the Middle and Far East or ships upon the Mediterranean and Indian Seas. Naturally, the hoisting of sails made travelling long distances easier and oars were the levers of motion. Where no waterways existed, they had to be introduced in the way of canals. Lifting machines dug the canals, but once water flowed within, craft could not be moved uphill! Solving the elevation of barges and other canal craft brought some of the industry's most innovative lifting the shiplifts, and not to be forgotten, drydocks that lifted ships completely out of the water! As luxury ships housed hundreds, even thousands of passengers, they became mini-cities requiring transportation between levels. 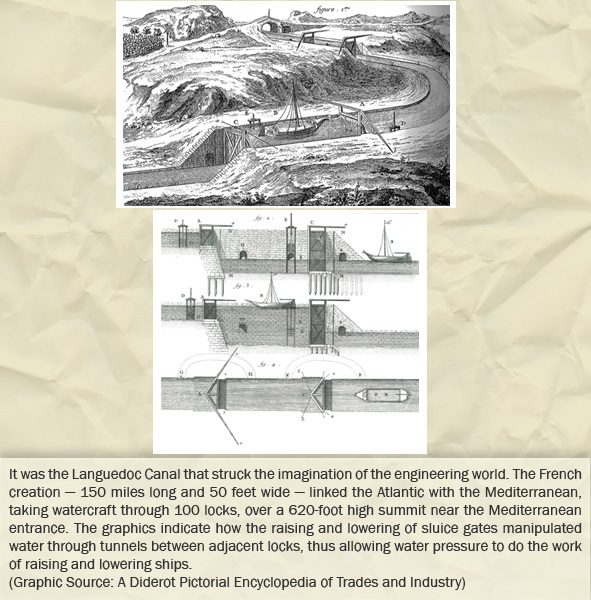 The French built the first great canals, the first being the Briare Canal linking the Seine and Loire rivers. The waterway elevated ships 128 feet within eight miles and then lowered them 266 feet over a distance of 23 miles. Canals multiplied during the 17th century. With the railroad being only a distant vision entrepreneurs looked to the development of water transport to carry the steadily increasing loads of the newly industrialized world. 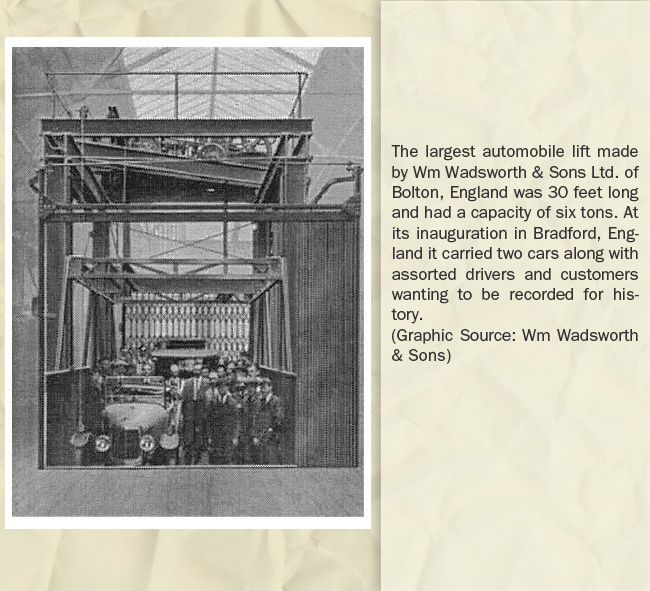 The trucking industry was awaiting national networks of modern highways also a far vision! Rail and train travel competed on land, century after century, through all power eras. However, even the heaviest rail cars had to be lifted for maintenance by hydraulic power. 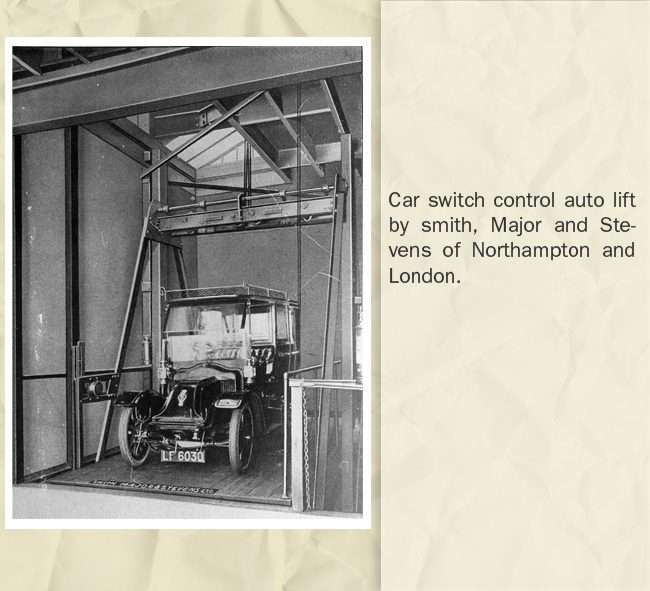 Automobiles were also raised for maintenance, but by far the greatest problem associated with cars was their overabundance in urban centers. Storage schemes proliferated to alleviate serious congestion problems. As will be seen in other galleries, during the era of air travel, as aircraft became larger, they had to be dispersed in more widely separated areas for embarkation. 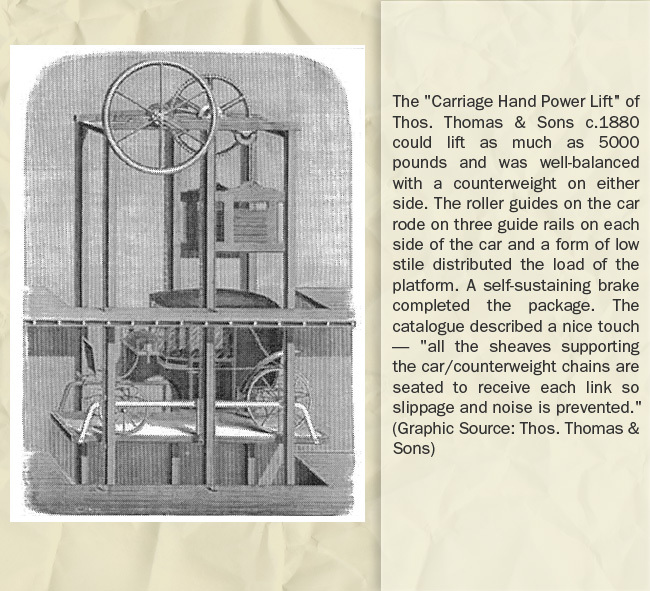 This necessitated the continuous movement of people between planes, and with land transport. 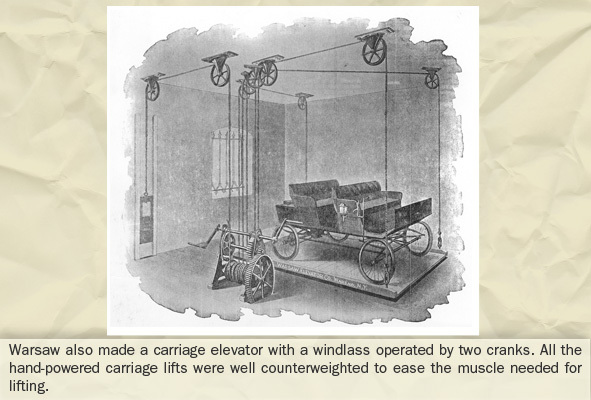 Escalators, moving sidewalks and shuttles helped alleviate this problem.